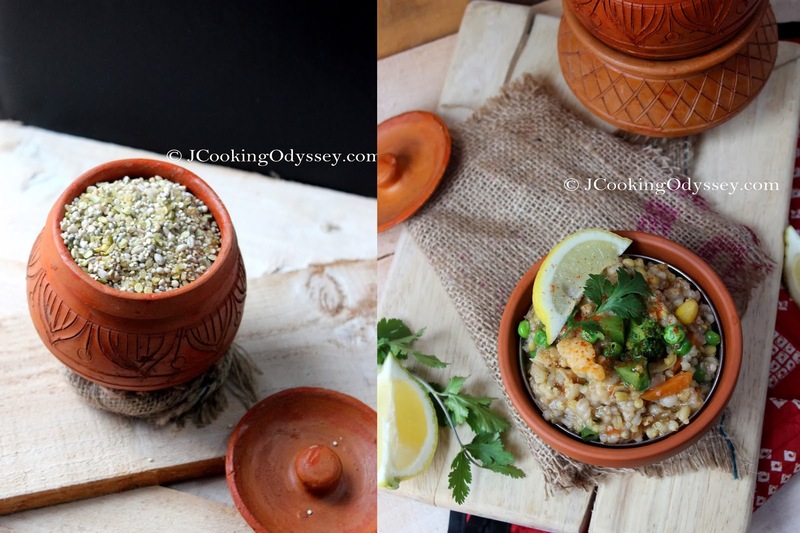 Jagruti's Cooking Odyssey: Bhaidku Masala Khichdi - Savoury Mixed Wholegrain Porridge ! 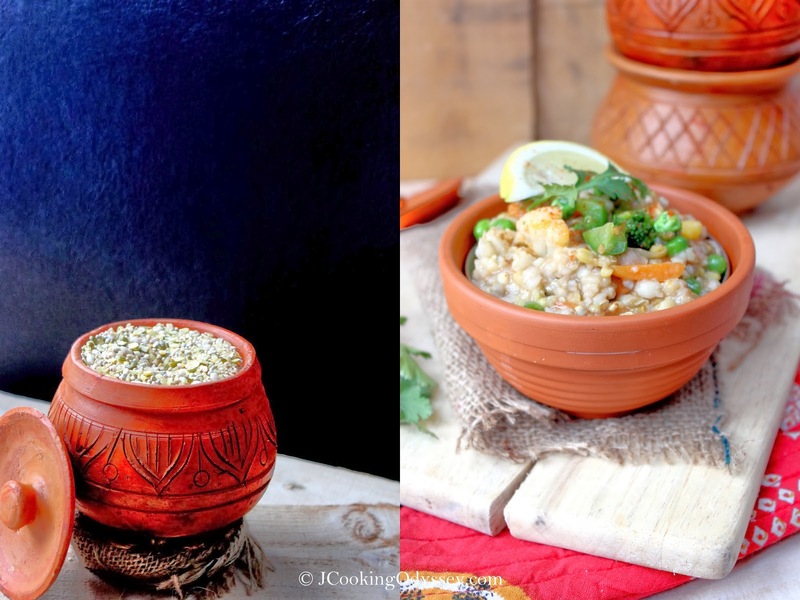 Bhaidku Masala Khichdi - Savoury Mixed Wholegrain Porridge ! 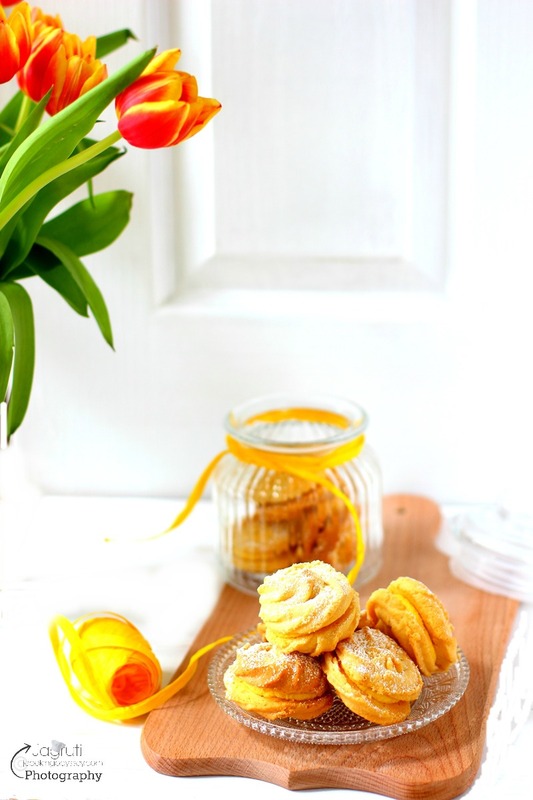 I did not grow up eating any kind of breakfast, it was always brunch that filled my tummy till the late afternoons. Milk was always available on the table, but me and milk never had a good relationship, while my siblings can gallop litres I would wait happily for brunch. I grew up in a family where my mum was very busy making the ends meet for us children, those were the days when like most families where breakfast, lunch and dinner were cooked it was different in our house. She did not have that kind of time so instead we were served a meal which was both a breakfast and a lunch around mid morning. This suited our life style as we siblings were attending school in the afternoon. It was typical household meal which comprised of a dry curry with chapattis of which some was for the school break time. One can argue that she could have bought many snacks such as biscuits, bread or fried snack, but mum was very health conscious and always kept us away from junk food. 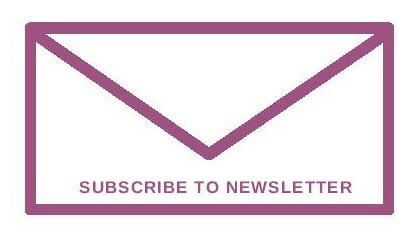 This was continued through the weekends and holiday periods too, although the food was more varied . Different type of rice dishes , khichdi and Bhaidku was served to us with a dollop of ghee. Mum would prepare recipes which are easy and quick to make yet they bursts with lots of goodness. We siblings were more than happy to devour plate of Bhaidku and chaas ( yogurt drink ). As I grew older, I started to take over the kitchen and cooking side of things, three meals of the day were regular in our home and mum was more than happy :) ! 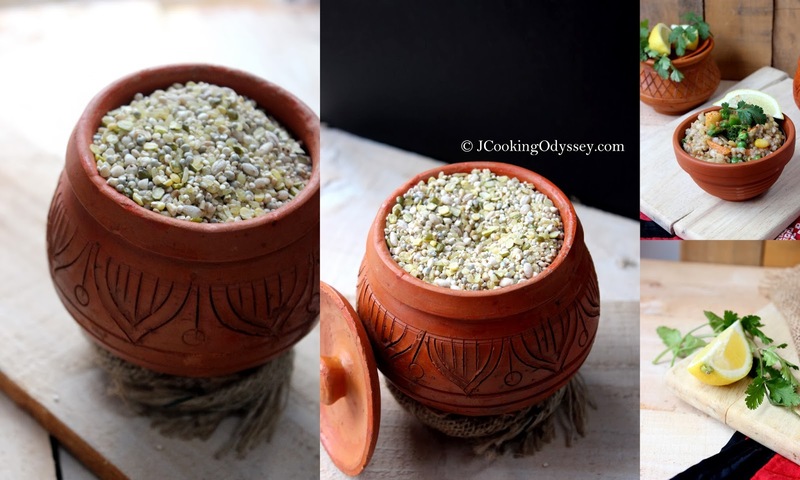 Bhaidku in Gujarati, Daliya in Hindi translates Spicy porridge made with mixed grains or their coarse flour like wheat, millet, barley, rice, and oats, but mum used to prepare with broken grains, so I am used to with that texture and taste. This dish can be made either plain or savoury, today I am sharing savoury version. Bhaidku can be served as a breakfast or lunch and if you are having low carb meal at dinner time this is the dish ! An extremely tasty and delicious, packed with health benefits and highly recommend for diabetic people or to prevent, since all the ingredients either has low GI or they have complex carb. It keeps you fuller for longer, so there are no hunger calls for a long time and saves you from attacking some nasty junks, while goodness of colourful vegetables lends you plenty of vitamins and minerals. 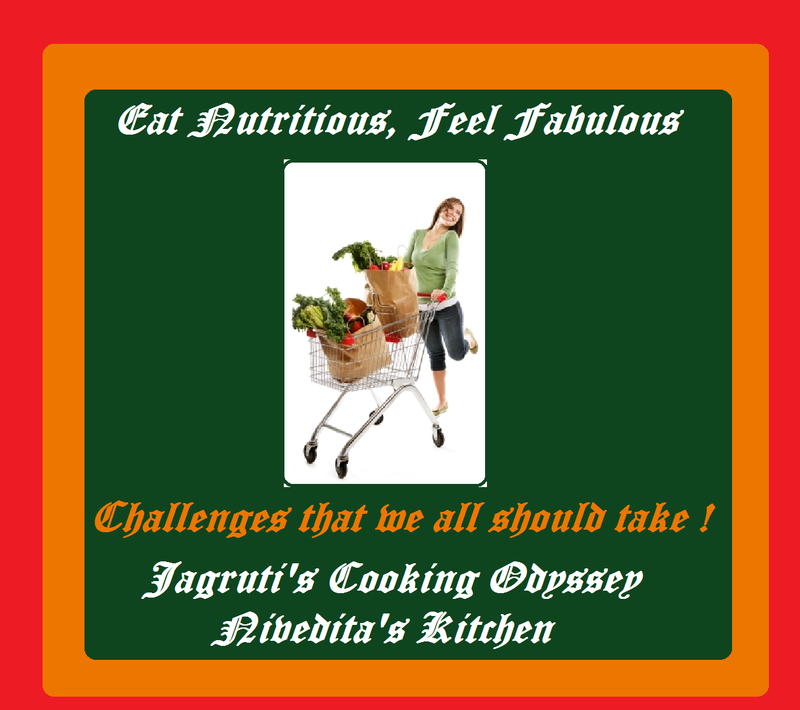 I have slightly moved away from the original recipe and added my own touch to it by adding few more grains as an experiment, as it turned out it was approved by family, there could not be a better way to add some more extra healthicious crunch in your diet to follow the slogan Eat nutritious, Feel Fabulous ! Mix everything and store in a air tight container. Place one cup bhaidku mix in a heavy based pan and dry roast for 5-6 minutes or you get slight toasting aroma . Add 1 cup water and switch off the heat and leave it aside to soak at least 4-5 hours. I leave it overnight. Place soaked bhaidku mix in a pressure cooker and add 1/2 cup water and salt and cook till 3 whistle goes off. Heat ghee or oil in a kadai , add chilli-ginger paste and garlic chutney. sauté for few seconds, add onion and fry till light brown. Add capsicum and cook for 2 minutes, add tomatoes and cook on a high heat for 2-3 minutes, now add all the other steamed vegetables and mix. Add salt and garam masala mix well and cook further for one minute. Add lemon juice and cooked bhaidku and give it a stir. Switch of the heat, garnish with chopped coriander and serve warm with plain or masala chaas. Onion and garlic can be omitted , instead use celery or shredded cabbage. BOILED Potatoes AND any other can be added too. Linking this healthy and tasty dish to challenge Eat Nutritious, Feel fabulous , brainchild of ME and Nivedita, this month hosted by Nivedita. Is this Bhaidku masala some special one from Gujarat ? Interesting I have never heard of this recipe will book mark and try.Incidentally I love the pots infact I cant stop drooling over them.